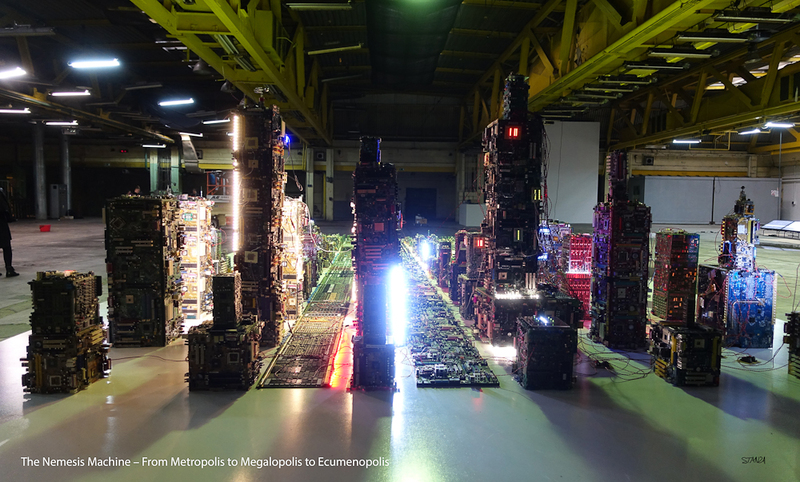 The Nemesis Machine – From Metropolis to Megalopolis to Ecumenopolis. 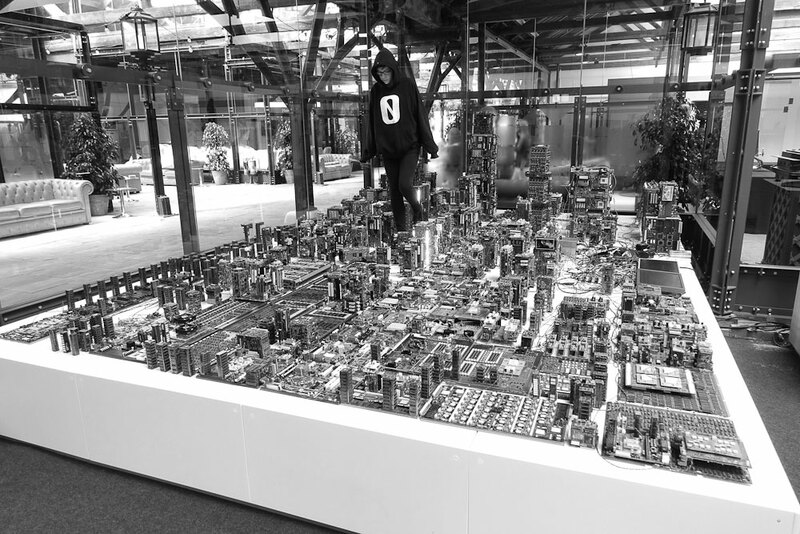 A real time interpretation of the data of connected cities. The Nemesis Machine is an ever evolving artwork, always different and always expanding. 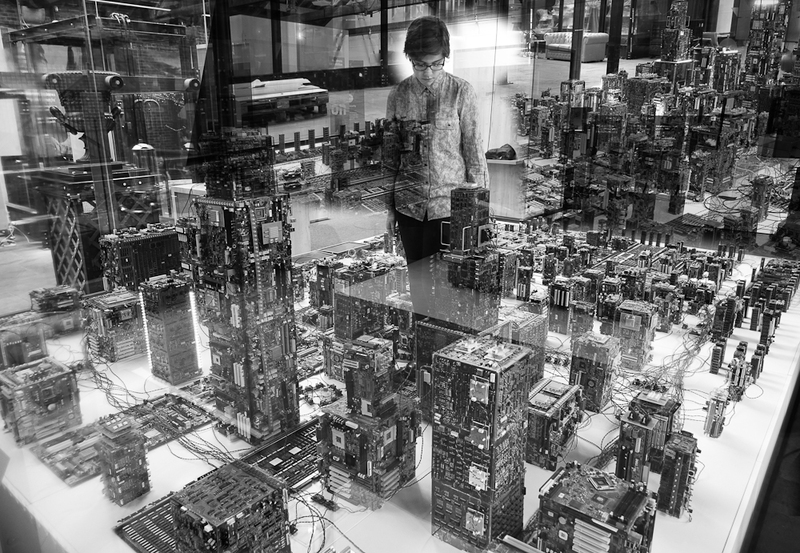 It has become a multi layered installation incorporating concepts of data ownership, surveillance, real time space, urban environments as well as systems based metaphors for interactive and generative spaces. The machine poses the question of who owns the data while speculating that virtual borders will soon create more systems of control. It is always different for each installed set up and is evolving dependent on the situation it becomes exhibited in. In the gallery the work can be shaped formally on the floor or also grow into different spaces. 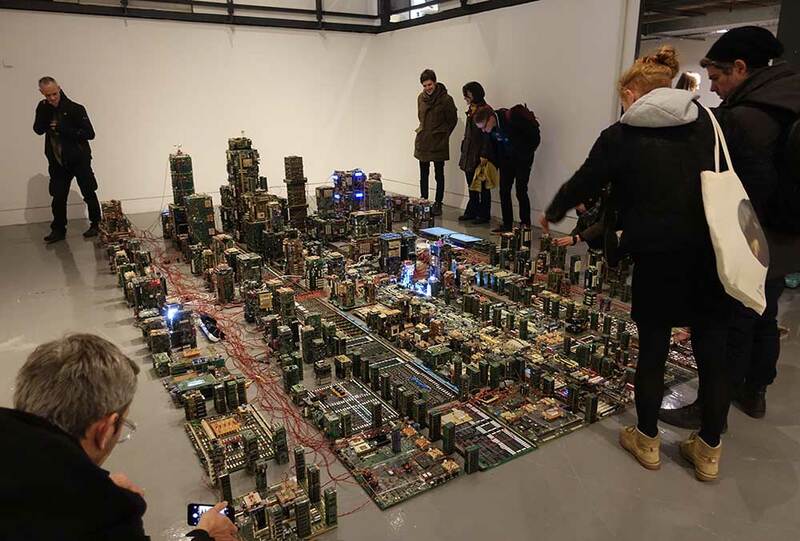 The parts of the city act as a frame for the different expression of data and information which is being expanded as the digital artwork develops. The artwork responds to wireless sensor network and "visualizes" the environment all around us as 'worlds' full of data across the internet. 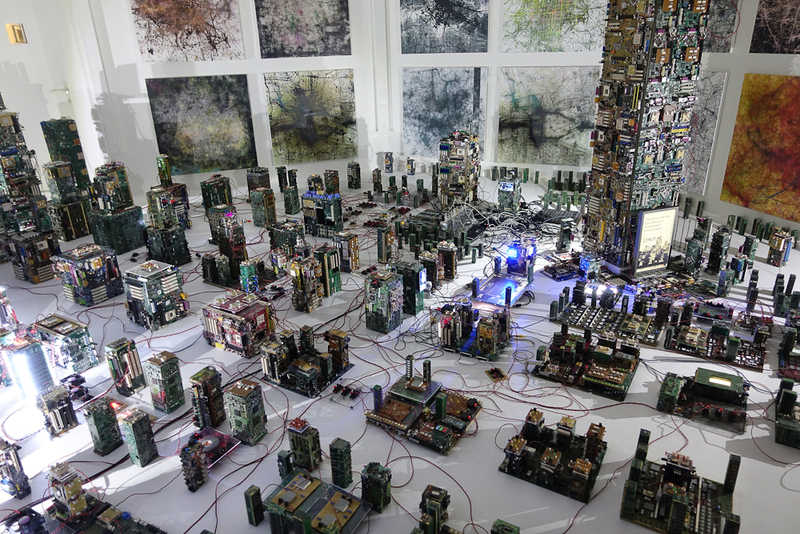 In essence the artwork is a smart city a hybrid internet of things (IOT) installation responding in real time and operates critically between utopian optimism and dystopian dysfunction. 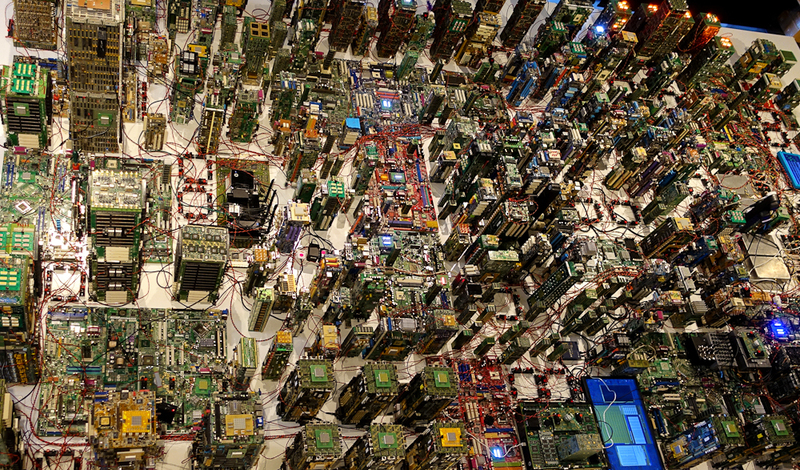 Information The Nemesis Machine becomes a mini, mechanical metropolis that monitors the behaviours, activities, and changing information, of the world around us using networked devices and electronically transmitted information across the internet. 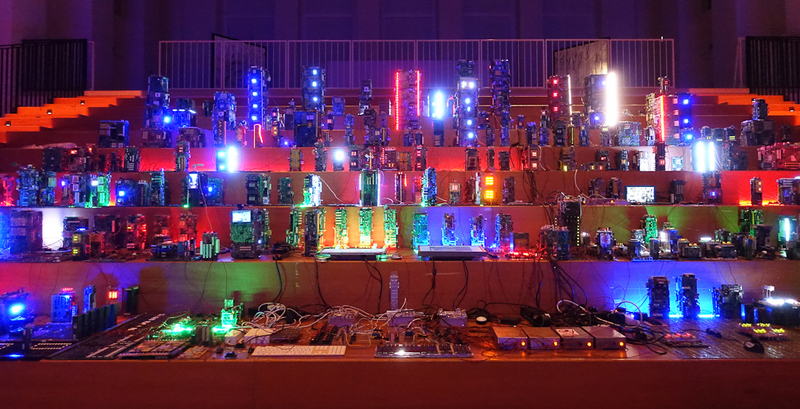 The Nemesis Machine has become a large installation which is adapted and customised to each place where it is displayed. 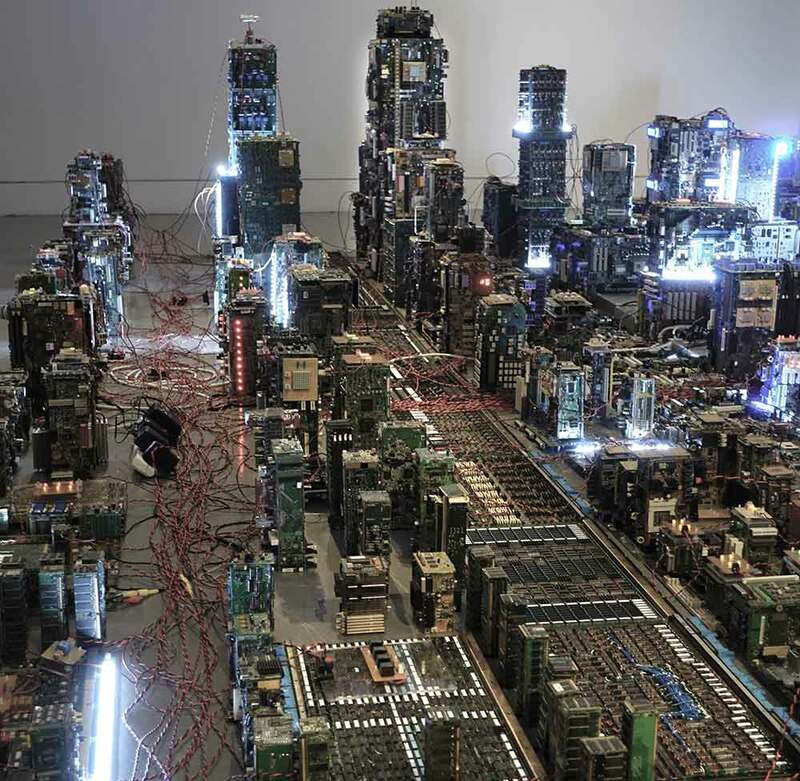 The artwork represents the complexities of the real time city as a shifting morphing and complex system. 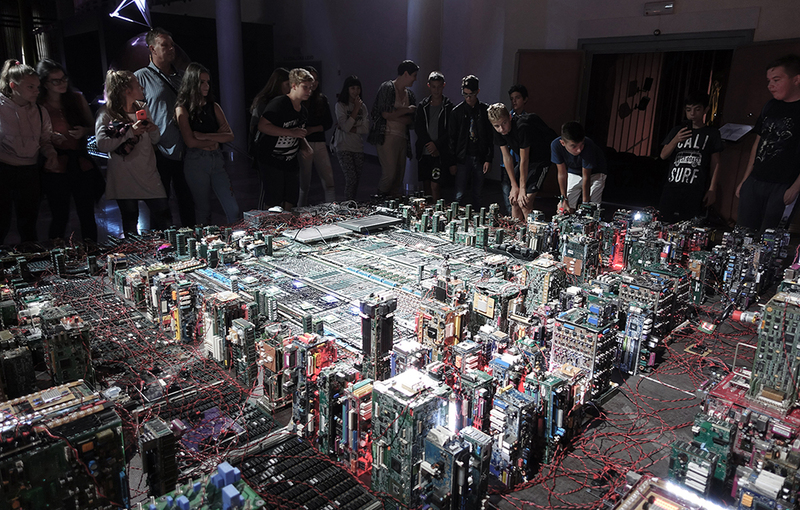 It visualises life in the metropolis on the basis of real time data transmitted from a network of wireless sensors. 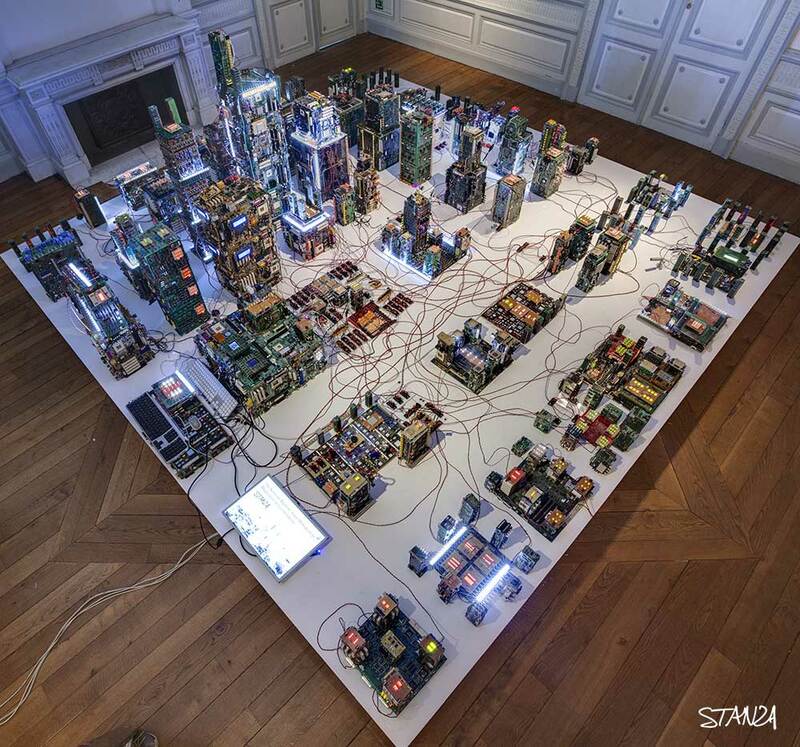 The artwork you see is a city of electronic components that reflect in real time what is happening elsewhere. Small screens show pictures of the visitors so that they become part of the city. The artwork reforms this information and data creating parallel realities. 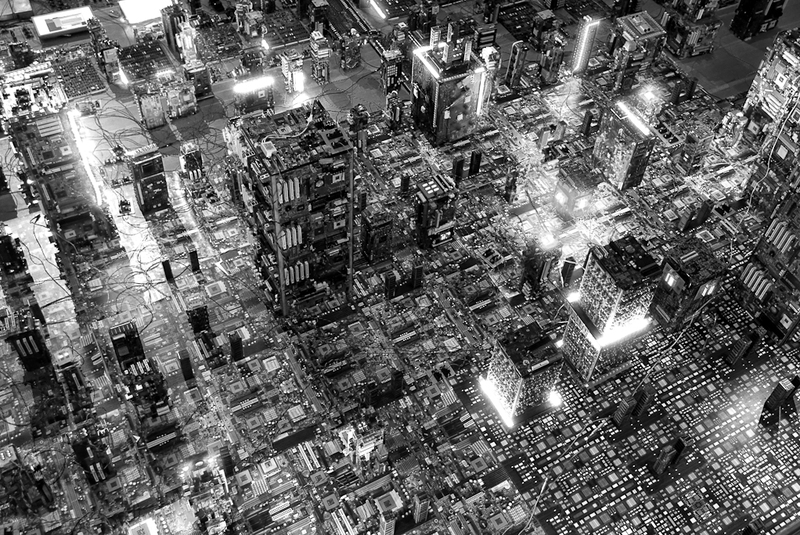 At the heart of this work lies an interest in the urban environment, the networks of cameras and sensors to be found there, and the associated issue of privacy and control. 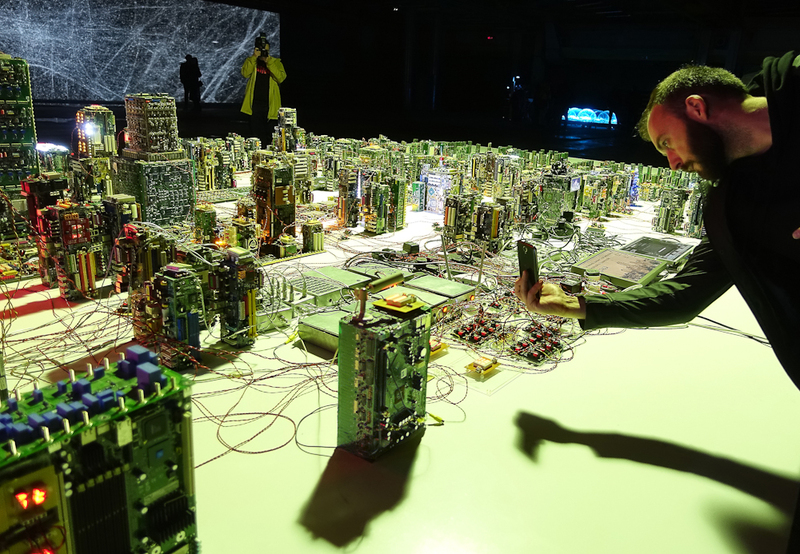 The artwork sits in the middle of concepts for smart cities, The Internet of Things (IOT) and the new technologies that monitors the real time environment. In appearance, the Nemesis Machine is like Big Brother parsed through the lens of the Internet of things. 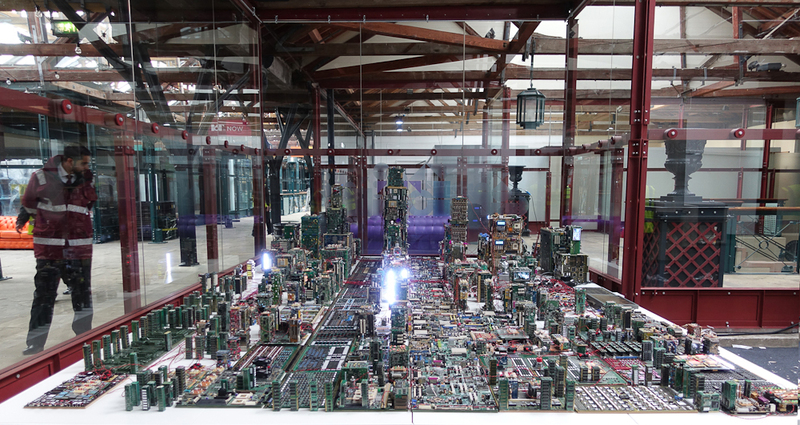 It gives visitors a bird's eye view of a cybernetic cityscape, where skyscrapers are constructed of silicon and circuit boards. 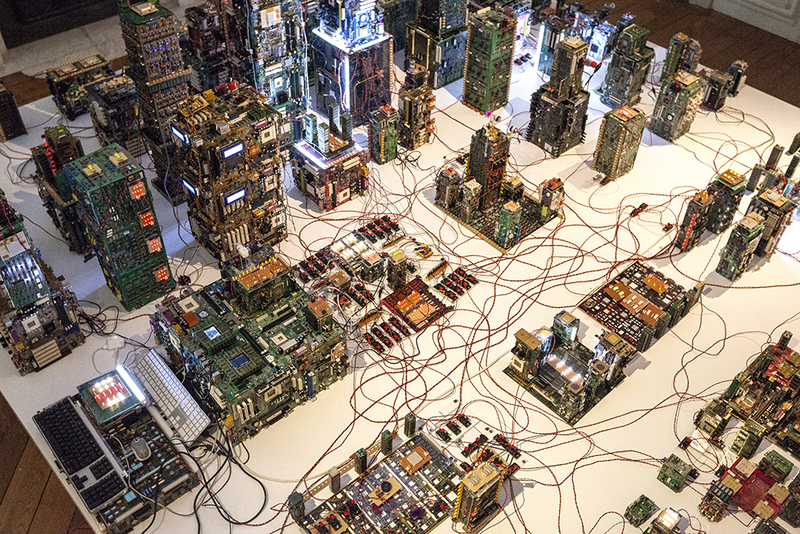 This digital artwork also focuses on how we consciously or unconsciously influence each other, and also the degree to which technology may in future take over control of our own bodies and our presence in the city. This is a city where there is no privacy. The Nemesis Machine asks how new technologies can imagine a world where we are liberated and empowered, where finally all of the technology becomes more than gimmick and starts to actually work for us. Or will these technologies as the machine suggests control us, separate us, divide us, create more borders as the machine spreads to encompass the whole world. This city governs itself and its actions and intelligence is completely controlled by data based on the interactions and flows of data. Touring. This artwork is available for exhibitions please get in touch. It is always different for each installed set up and is an evolving artwork. In the gallery the work can be shaped formally on the floor or also grow into different shapes and spaces. C. Large version (50 metres and much larger is available). D. Extra Large version (100 metres -150 metres square and much larger is available. ). Development. This is an ever evolving and changing artwork. I am also developing new areas and several new concepts and data types are being introduced into largest version. Funding is need for futher technological expweriemtns with this. Further Development. Stanza would also like to make a much bigger version <=> four times as big. If you can fund this it would be 15m by 15m up to 200 square metres and larger the exact nature of this would depend on the space and would it have several new areas built in and need a map to navigate. Curators please speak to me about this. Image from Poland Warsaw. 2017 (the size here is 10 m by 5 m ) ie 50 m square. 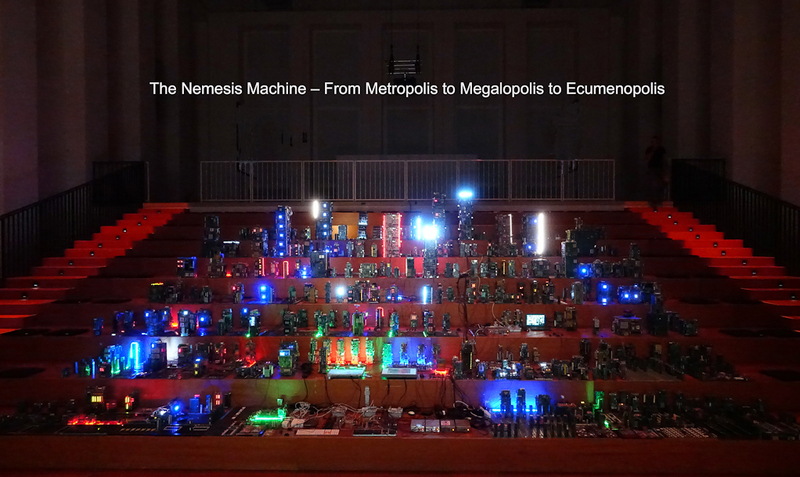 The title is in two parts: “The Nemesis Machine” with the additional “From Metropolis to Megalopolis to Ecumenopolis”. The installation has become an evolving artwork. 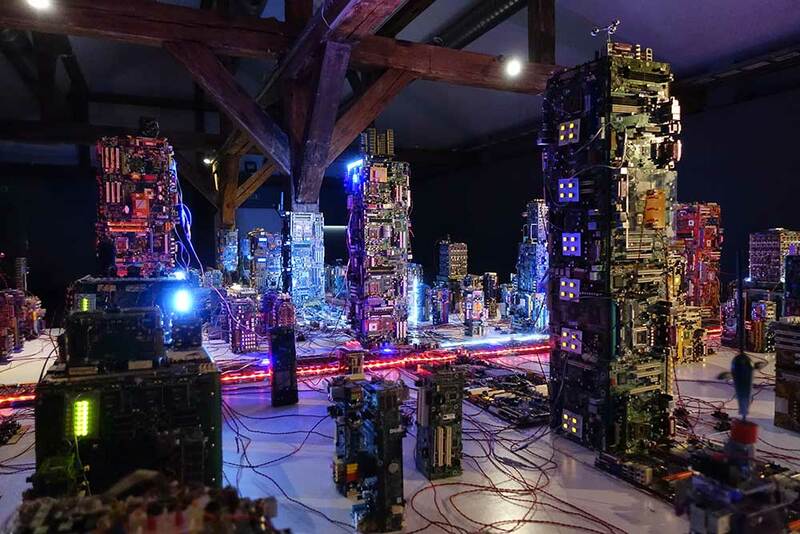 Whilst growing in physical size, the technology is also developing to reflect changes in our relationship with the digitised world, new technology, and our algorithmic society. The artwork focuses our attention on the worlds of technology, surveillance, and networked space:- that could be called panoptic and embeds several contextualised panoptic aesthetics (data from sensor networks, people from cameras). 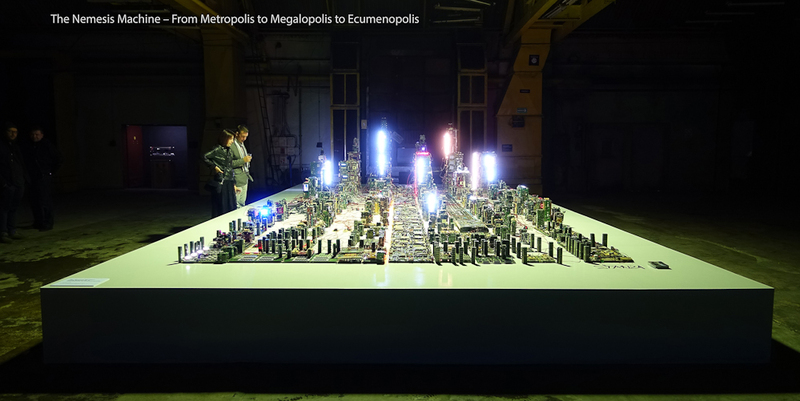 My title “From Metropolis to Megalopolis to Ecumenopolis” expresses this growth from a small city, to a large city, to the ecumenopolis which is a term for the whole world as a city. The inference is that this system of technology is all encompassing all seeing and all powerful. The title “Nemesis” also suggests a portrayal of either utopian or dystopian futures inferring, “the inescapable agent of someone's or something's downfall”. As such the Nemesis itself is positioned to cause concern as a situation or event, which causes serious harm, or even as a form of punishment. The word Nemesis originally meant the distributor of fortune, neither good nor bad, simply in due proportion to each according to what was deserved. Nemesis was sometimes called "Adrasteia", probably meaning "one from whom there is no escape". This is how the artwork positions itself as neither one or the other, but simply to engage the viewer or its audience inside this inescapable agency. 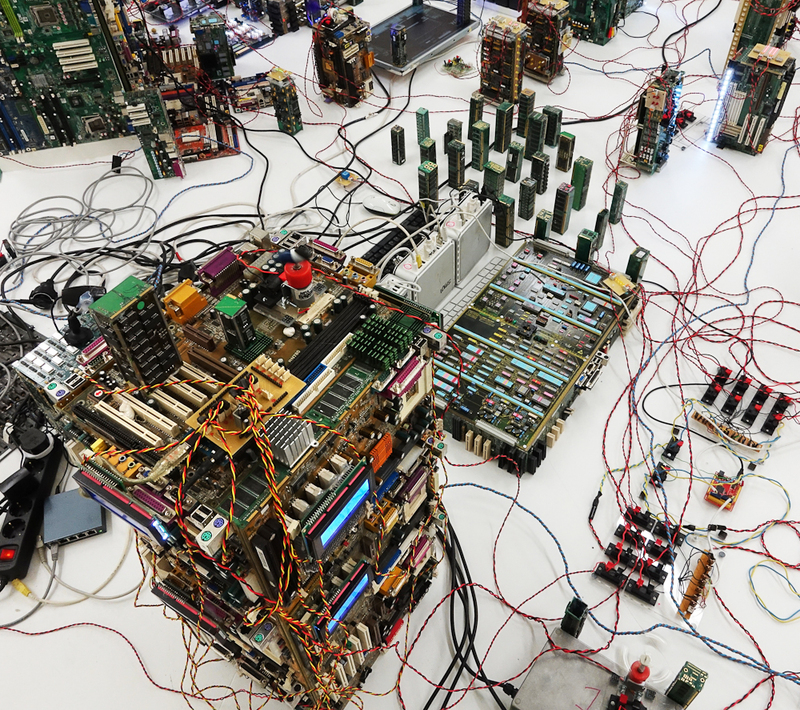 The artwork has grown as a multi layered expression of technology based futures with metaphors of big data, privacy, liquid surveillance and control. It now also embeds as part of its evolution a continuous focus on the way we seek to control our space through any new technology. 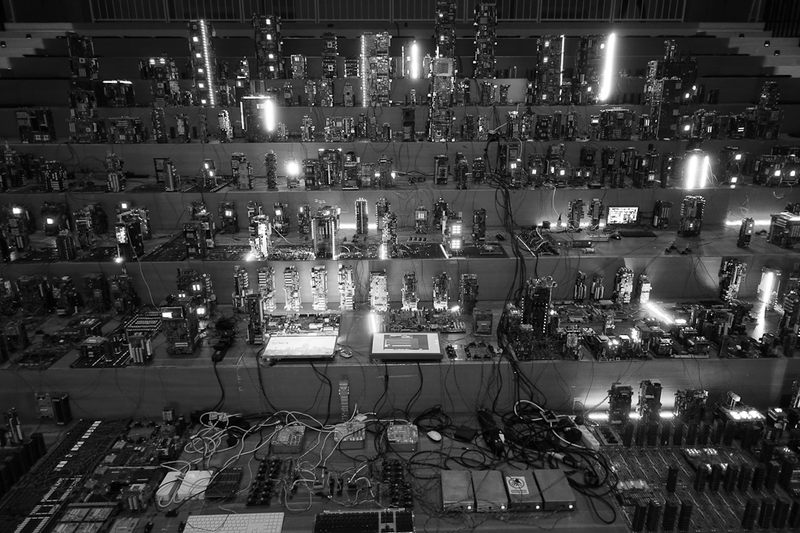 The project The Nemesis Machine actually started under my project title The Emergent City as practise based research and the data visualisation called Sensity. 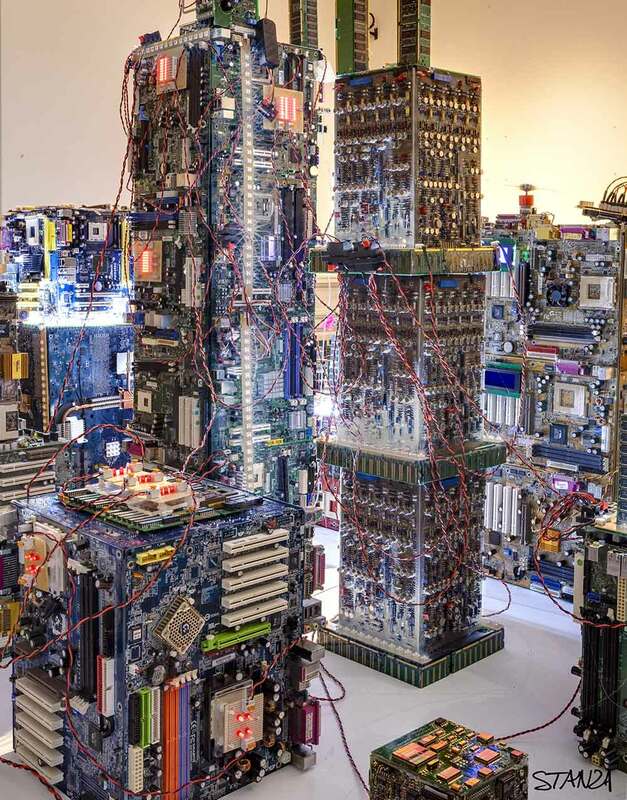 Therefore The Nemesis Machine has now been in development since 2006 and many various iterations have been made and released, which been exhibited in numerous ways with varying sizes. 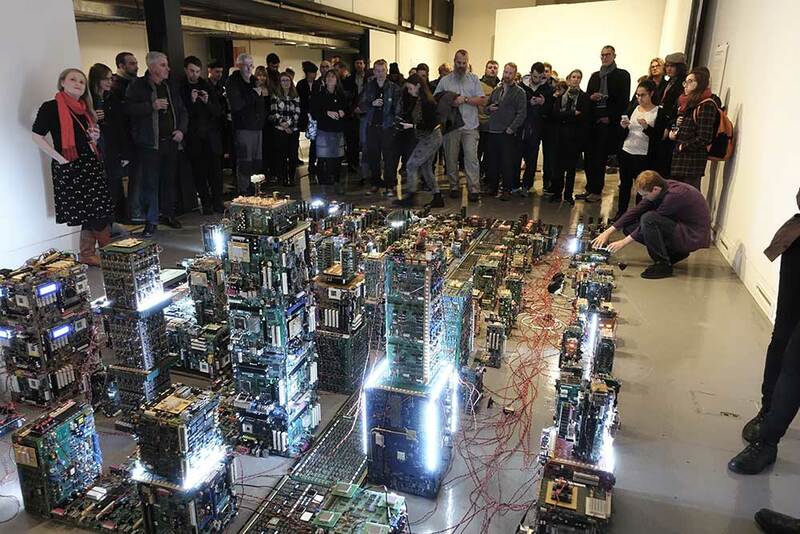 The Nemesis Machine fuses analogue and digital worlds by using real time data feeds that connects to the physical city to create an avatar city while at the same time making it global through the flows of networked data across the internet. 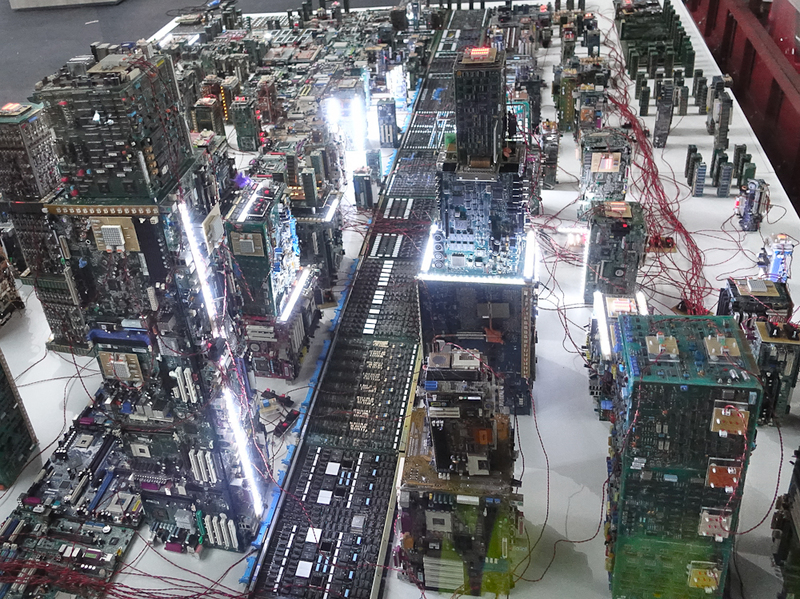 The city machine become alive and of itself. This parsing of real time data systems becomes a critique of liquid surveillance networks that a whole city can be seen all at once from a variety of perspective lenses. The machine is both acting to liberate us through technology with overtures to open processes, while at the same time making us complicit in its restrictive system of control. We have by default become complicit in the global surveillance machine that appropriates us (the users) as units of data to be harvested for some sort of gain (either financial, social). This has been a consuming theme in several of my artworks since 2004. 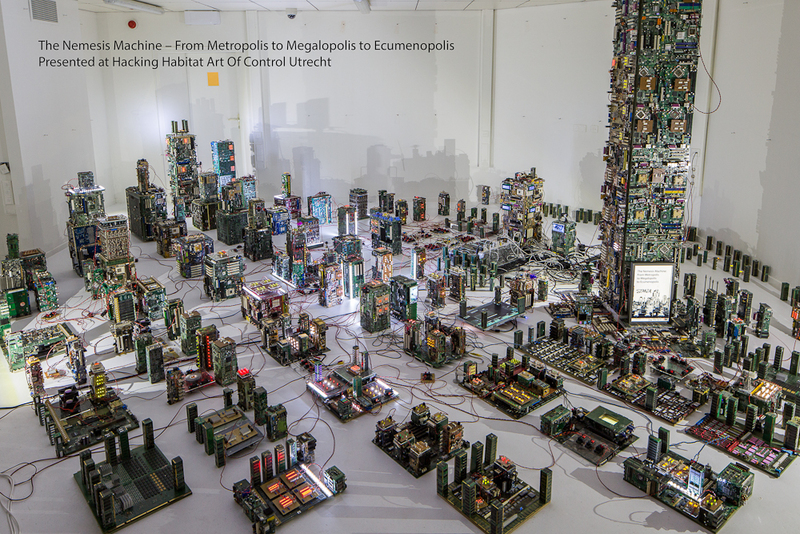 The Nemesis Machine focuses on the aspect of the so called smart city as a space for the parsing of (any /all) data. So how can you make meaning of this liquidity? and how can it be of any common benefit? Or will it be at the expense of something else? as perspective shifts ground. A new custom version of the artwork is installed every time for this ever expanding an variable artwork. 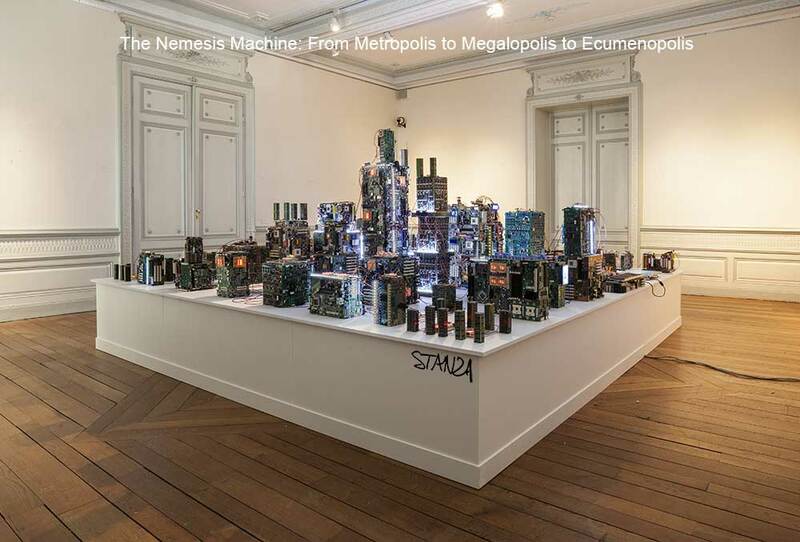 During many set ups and global exhibitions, The Nemesis Machine serves as a frame or lens to witness this process. 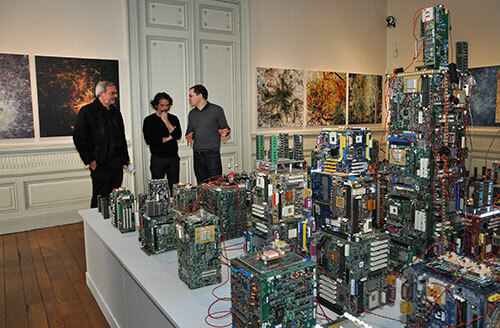 A custom made multi mesh network of environment sensors that send data in real time to the artwork. A camera based surveillance with several hidden cameras inside the artwork. There is also another local layer of sensors; which includes systems for measuring by pollution gases no2, co2, o2, and alcohol. All this combines to create all the agency and action in the artwork. In other words the lights, motors, and sounds only happens because of events occurring in the real space. 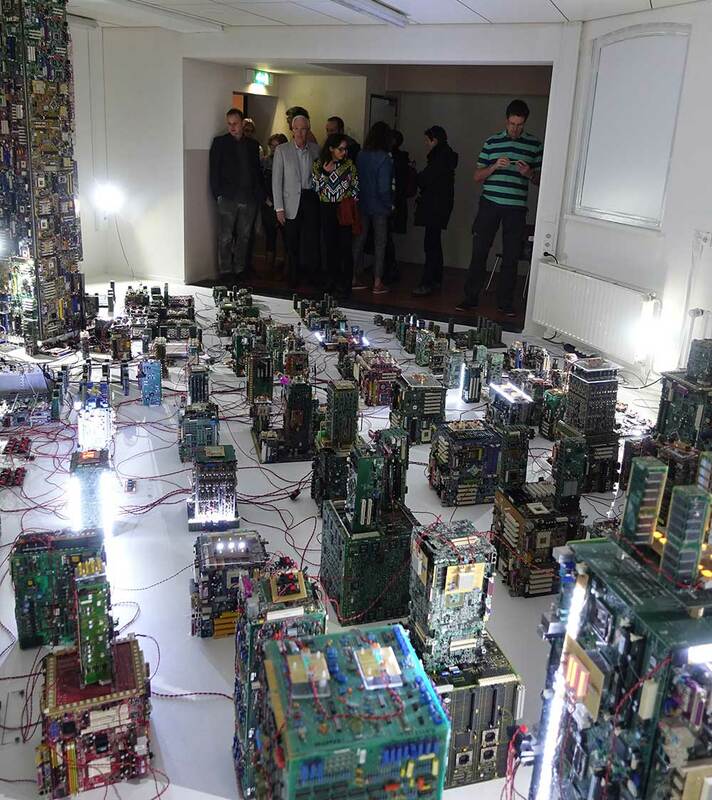 In this sense the city and the artwork are one and the whole artwork functions as an algorithmically coded city observing its real world double. 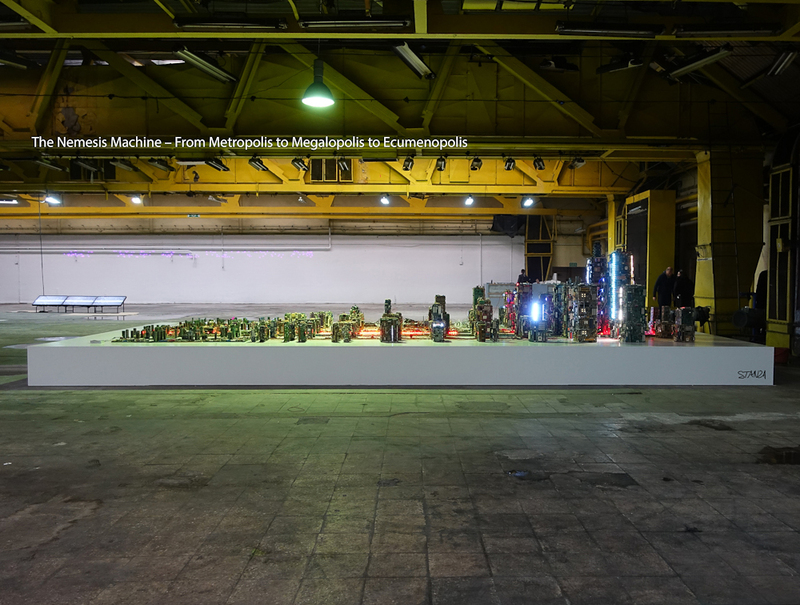 The Nemesis Machine suggests a global panoptic experience of connected devices which is oscillates between a cyberpunk dystopian nightmare to a utopian social enagement perspectiveof embedded technologies as the machine seeks to become ecumenopolis. This data flows like a liquid, the capital system of which we are now co-conspirators or co-laborators. The age of privacy is over. 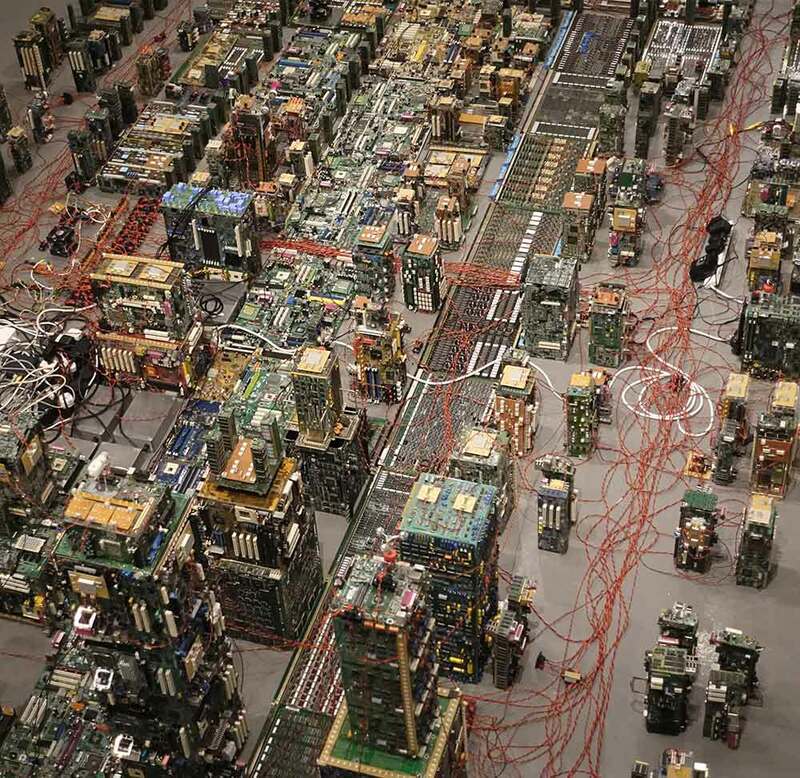 Imagine walking out the door, and knowing every single action, movement, sound, micro movement, pulse, and thread of information is being tracked, monitored, stored, analyzed, interpreted, and logged. 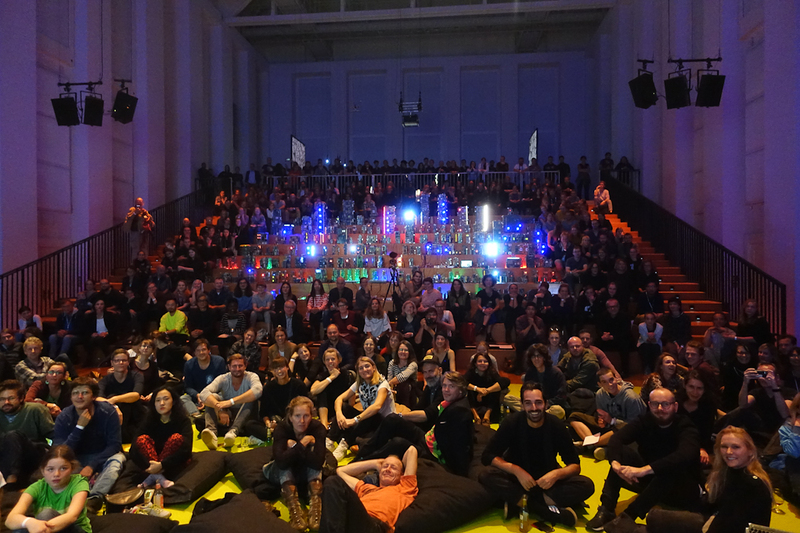 The world we will live in seems to be a much bigger brother than the Orwellian vision, it is the mother of big brother Stanza current artworks go further towards inviting the city and the people that inhabit it to populate and become the artwork. 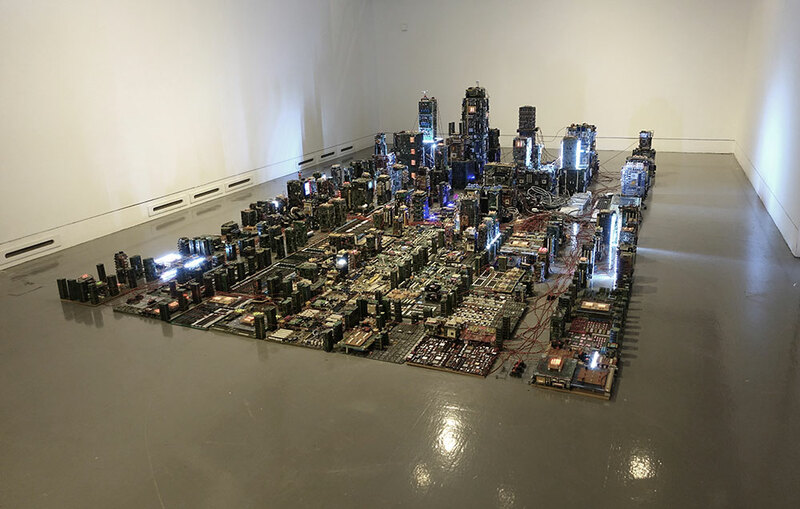 From the previous generative and interactive art such as The Central City, (1997) the artworks have moved to open systems that collect and re-appropriate real-time data to create multifaceted ‘urban tapestries' such as the Urban Generation (Stanza, 2004) . 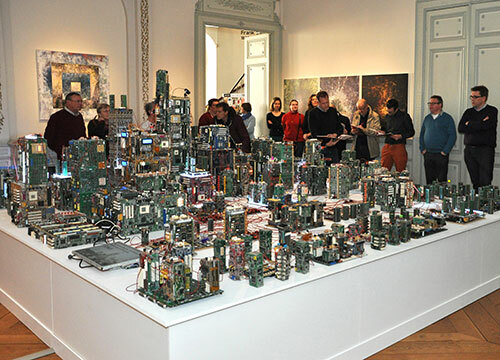 Even more recent installations consists of two elements: a physical installation within the gallery space made from hundreds of electronic components such as fans, leads and motors, which resembles a miniature electronic city; and a tailor-made network of wireless sensors that is embedded within the gallery space and the urban landscape that surrounds it, and which collects data from its environment. The data collected include GPS positions, humidity, noise, temperature, and light' (Stanza, 2008 onwards). What I am is doing, is hacking access to a network and re-appropriating the data and information. By re-contextualizing it to give data as property wider meaning; "data is the medium of the age. The real world is made virtual and then real again across the internet". Wide angle lens view of 64 sq metre version. 2018 )large vestion. 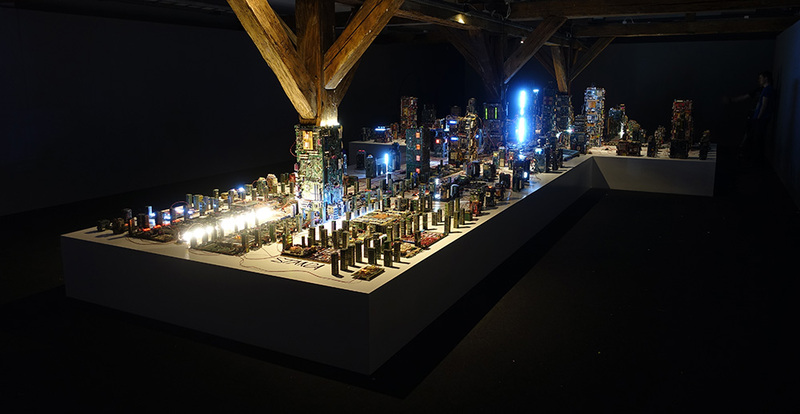 Images from Hacking Habitat exhibition Holland curated by Ine Gervers. Medium sized version. Images above from Medium Version shown in Slovenia. 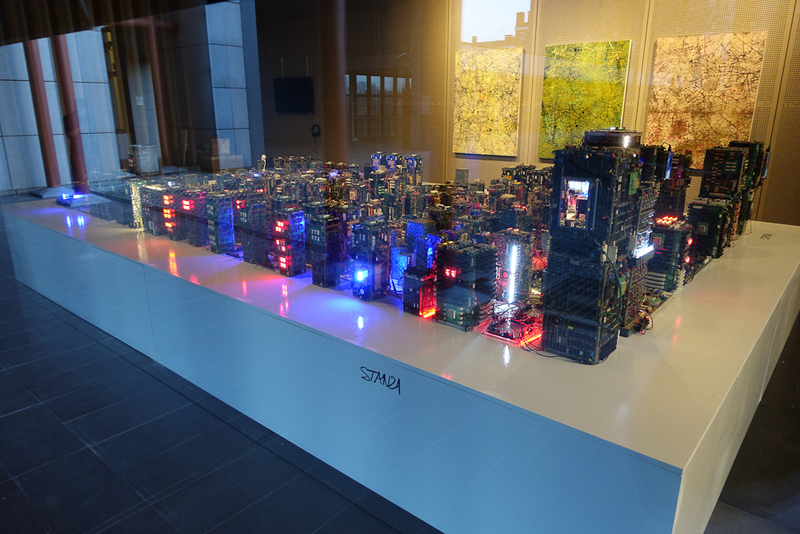 Stanza has been researching wireless sensor networks, smart cities and the internet of things since 2004. He uses motes sensors in a network. Stanza deploys custom built software that gathers data and places the data online via a java proxy server. The data used to create the visualizations is also made available in an open source environment. Because the data is networked other online users can also re- interpret the data and interrogate the various sensors in the network (via xml streams online). The various sensors monitor temperature, sounds, noise, light, vibration, humidity, and GPS in real time.The artwork has local sensors that monitor the gallery as well as the city, embedded cameras and live data feeds. 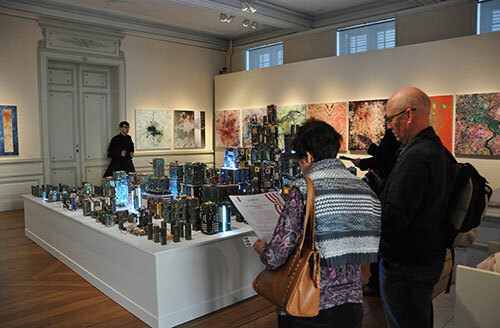 Installation at Bruges Museum 2015 with Stanza Paintings. We understand the 20th century in terms of atoms, molecules and gases that move. Our world is now a world of numbers and changing data and information. This art installation manipulates these numbers and the data from the living world; all of this affects the installation ie; the artwork in the gallery space and all the changes occur in real time. The real world is made virtual and the virtual is made real again and exposed in the process. This whole piece is a living and breathing artwork. The project focuses on the micro-incidents of change, the vibrations and sounds of the environment using wireless sensor based technologies. 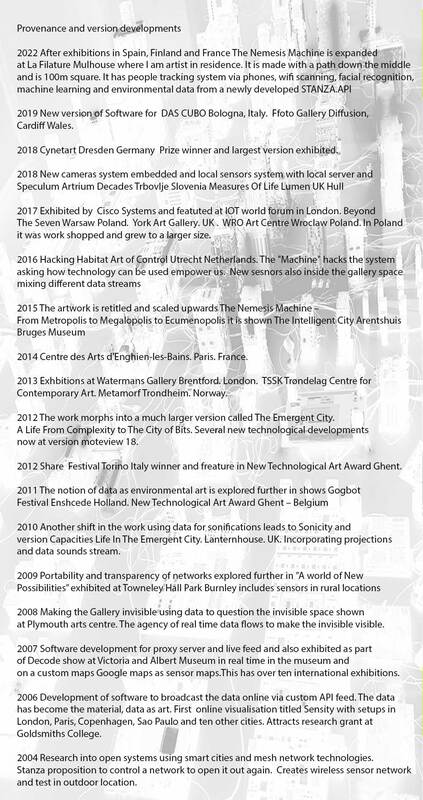 Keywords: Online, data visualisation, artwork, system, generative, machine intelligence, surveillance, art, installation, AI. Dundee Contemporay Arts at Centrespace (VCR) NEoN. Dundee 2016 (above) Curated by Sarah Cook. GERMAN. 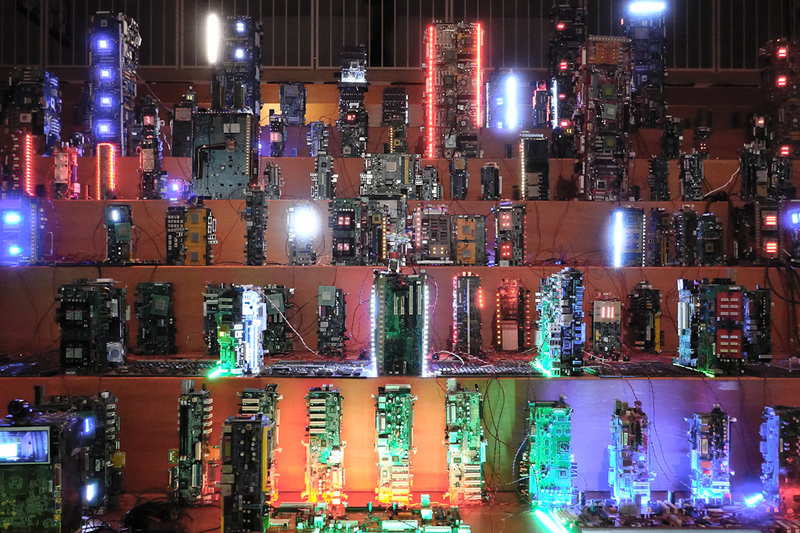 The Nemesis Machine ist ein Kunstwerk, das sowohl unser Verhalten als auch den Datenstrom über vernetzte Geräte und über das Internet abbildet. Die Nemesis-Maschine wird dabei zu einer großen Installation, die an jedem Ort, an dem sie ausgestellt wird, angepasst wird. Im Fall der CYNETART jedoch nicht an Dresden oder die Gartenstadt Hellerau, sondern an Hong Kong. 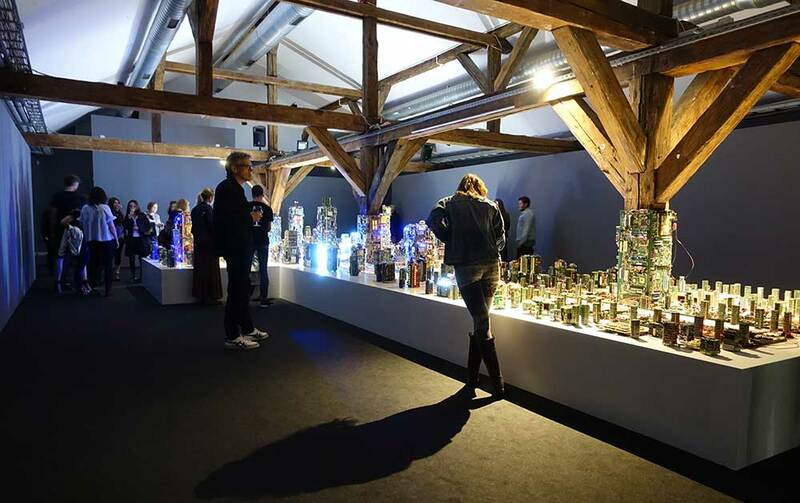 Das Kunstwerk stellt die Komplexität des Ortes in Echtzeit dar, als ein sich veränderndes und komplexes System. Es visualisiert das Leben in der Metropole auf der Basis von Echtzeitdaten, die von einem Netzwerk drahtloser Sensoren übertragen werden. 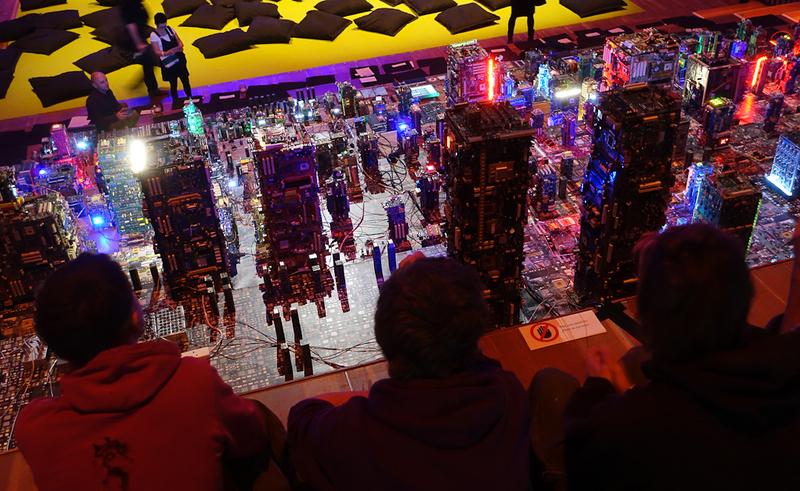 Die Arbeit ist eine Stadt der elektronischen Komponenten. Es spiegelt in Echtzeit wieder, was anderswo passiert. Kleine Bildschirme zeigen Bilder von den Besuchern, so dass diese Teil der Stadt werden. SLOVENE. The Nemesis Machine je mini mehanska metropola, ki nadzoruje obnašanja, delovanje in spreminjanje informacij v svetu okoli nas. Za ta namen uporablja povezane naprave in elektronsko mediirane informacije poslane preko interneta. The Nemesis Machine je postala velika inštalacija, ki je prilagojena in prirejena vsakemu prostoru kjer je razstavljena. Umetniško delo predstavlja kompleksnost realno-časovnega mesta kot spreminjajoč kompleksni sistem. Na osnovi realno-časovnih podatkov, sprejetih preko mreže brezžičnih senzorjev vizualizira življenje v metropoli. Umetniško delo ki ga vidite, je mesto elektronskih komponent, ki realnem času odsevajo kaj se dogaja drugje. Majhni zasloni kažejo slike obiskovalcev, tako da tudi te postanejo del mesta. Umetniško delo preobliči te informacije in podatke ter ustvari paralelne realnosti. V osrčju tega dela leži interes za urbano okolje; mreže kamer in senzorjev, ki se nahajajo v njem, ter povezana vprašanja zasebnosti in kontrole. Umetniško delo je presečišče konceptov pametnih mest, interneta stvari (The Internet of Things – IOT) in novih tehnologij, ki nadzorujejo realno-časovno okolje. V izgledu je the Nemesis Machine kot Veliki Brat (Big Brother) razdeljen skozi lečo (perspektivo) interneta stvari. Obiskovalcem ponuja ptičji pogled kibernetske mestne perspektive, kjer so nebotičniki zgrajeni iz silicija in vezij. Podatki in njihove interakcije – dogodki, ki se dogajajo v okolju, ki obkroža in omejuje inštalacijo – so spremenjeni v silo, ki animira mesto v življenje s povzročanjem premikanja in spremembe; oziroma drugače, spremenjeni so v nove dogodke in dejanja. Na ta način mesto igra samega sebe v realnem času preko svoje fizične poosebitve ali elektronskega dvojnika. Mesto katerega vidimo igra samega sebe skozi drugo mesto. Vzrok in posledica postaneta očitna na diskreten in intuitiven način. Ko se neko dejanje zgodi v resničnem mestu, povzroči da se drug dogodek zgodi v njegovem popolnoma drugem, a popolnoma vključenem dvojniku. Poosebitveno mesto ni zgolj kontrolirano s strani resničnega mesta v smislu funkcije in operacij, ampak je popolnoma odvisno od njega za svoj obstoj. Umetniško delo se prav tako osredotoča na to kako zavedno ali nezavedno vplivamo drug na drugega in na stopnjo, do katere bo tehnologija v prihodnjosti, prevzela kontrolo nad našimi telesi in prisotnostjo v mestu. To je mesto kjer ni zasebnosti. The Nemesis Machine se sprašuje kako lahko nove tehnologije predstavijo svet, v katerem smo osvobojeni in opolnomočeni; kjer ta tehnologija končno postane več kot zgolj domislica in začne resnično delati za nas. Ali pa nas bodo, kot stroj to nakazuje, te tehnologije kontrolirale, delile, razdvajale in ustvarjale več meja. DUTCH .Gangmaker voor “Triënnale Brugge 2015” STANZA’S “THE INTELLIGENT CITY”: WE ZIJN GEZIEN! Vanaf 20 mei komen ongetwijfeld interessante, leuke, pittige antwoorden op deze vragen. Een interessante denkpiste werd eerder dit jaar al geopend door de Amerikaanse Ellen Harvey. Deze had vanuit New York gemerkt dat Brugge vlak bij zee ligt en dat daar nooit gewag van gemaakt wordt. Velen lijken het niet te weten, of zijn het vergeten. Niet zo de Brugse burgemeester (tevens schepen voor cultuur, toerisme en de haven). De haven is een meerwaarde, maar het Brugse strand blijkt niet geliefd. Harvey zette in het Groeninge sowieso een knappe expo op. Andere creatievelingen met naam en faam waren ondertussen al in de stad en zijn momenteel ideeën aan het uitwerken. Ook Brugse culturele verenigingen springen in de dans en “indoor” zal ook een en ander te zien zijn. Zoals momenteel in het Arentshuis. De Londense kunstenaar Stanza, sinds decennia gefascineerd door de problematiek verstedelijking, privacy en vervreemding, palmt er een ruimte in voor zijn “stad van de toekomst”. Een grootstad in het klein, opgebouwd uit niets dan computeronderdelen. Maar liefst 14 dagen had hij in Brugge nodig om zijn stad van de toekomst op te bouwen. Strakke, monotone hoogbouw en overal schermpjes waarop cijfermateriaal aantikt, talloze lichtjes die ononderbroken aan- en uitflikkeren, en dit alles gegenereerd door “data” die in real-time vanuit zijn Zuid-Londens sensorennetwerk komen. Voorts betrekken kleine camera’s de bezoeker in het geheel. Aan de wanden een reeks schilderijen (prints) waarin wegen en rivieren dermate verkleind zijn dat ze eigenlijk fraaie, maar tegelijk bizarre soorten abstracte schilderijen reveleren. 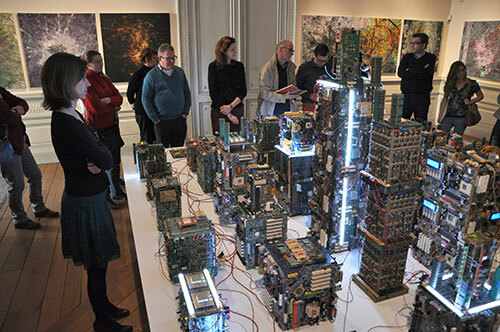 In de brochure lees ik: “The Nemesis Machine: van metropolis tot megapolis tot oecumenopolis”. Dit klinkt me wat onheilspellend in de oren. Is Nemesis immers niet de Griekse godin van de weerwraak? Stanza bouwt, creëert en verbindt, maar laat een opening voor de bezoeker: zullen we er in de (verre?) toekomst in slagen de technologie voor ons te laten werken of gaan de nieuwe technieken ons beheersen, verdelen, van elkaar vervreemden en nog meer grenzen scheppen? Een jonge bezoeker uit Berlijn vertelt ons dat hij normalerwijs niet zou schrikken van zo’n “futuristische” installatie, maar dat hij dat na twee dagen Brugge blijkbaar wél heeft gedaan. Verrassend blijkbaar zo’n beeldende, met de realiteit verbonden suggestie in de aloude stede. Even heeft Stanza wat tijd om te filosoferen. Dat elke auto die Londen vandaag binnenrijdt geregistreerd wordt, dat steden naar elkaar toe groeien, op elkaar gelijken, dat in Londen pubs plaats maken voor…kerken. Dat ook digitaal de kloof rijk-arm almaar groter gaat worden.” In de hal staat “Body 0100001001101111011001000111001”, een sculptuur gebaseerd op een 3d-scan van de kunstenaar en gemaakt van leds, motors, kabels en speciaal ontworpen elektronica. “The Body…” reageert op verschillen in temperatuur, licht, luchtdruk, geluid, zoals ze zich voortdoen in Zuid-London, waar Stanza’s sensoren-netwerk zich bevindt. De Body blijft tot 18 oktober, maar wie “The Intelligent City” wil zien heeft maar tijd tot 10 mei. Watermans Gallery Brentford. London. 2013. The Nemesis Machine: The New Decayed. 2020. Coming soon Exhibition in progress. (one decade in development) . Curator and funding need for next version.